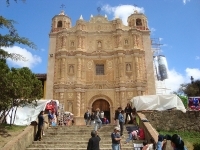 San Cristobal de las Casas is above all a cultural hub, and there are many wonderful cultural attractions. The Na Bolom Cultural Centre is a wonderful place to learn a bit about the Lacandon people in a colourful and charming compound full of interesting artefacts and personal effects (it is even possible to spend the night in the centre if you fall in love with it). The Museo de Trajes Regionales, a museum of Mayan textiles, is also a fantastic cultural experience. 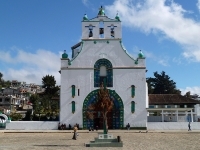 The highland villages of San Juan Chamula and Zinacantan, home to the Tzotzil people who are descendants of the ancient Mayans, are nearby, but travellers should be very respectful and it is best to go with a local guide. Other attractions worth seeking out in San Cristobal de las Casas include the Orquideas Moxviquil, a botanical garden sheltering more than 450 indigenous plant species, including some stunning, delicate specimens; and the fascinating Museo del Ambar (Amber Museum). Santo Domingo is the town's most beautiful church and although it is a little rundown it is still definitely worth a visit. 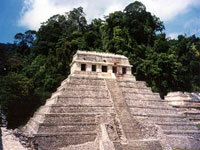 The main archaeological site in the area is the impressive ancient Mayan site of Palenque, the remains of a city dating back to the 7th century, which many consider the most remarkable ancient Mayan site.